In parts one and two I covered all of the barbecue and formal education aspects of the trip. Now we're down to where the rubber meets the road -- literally. 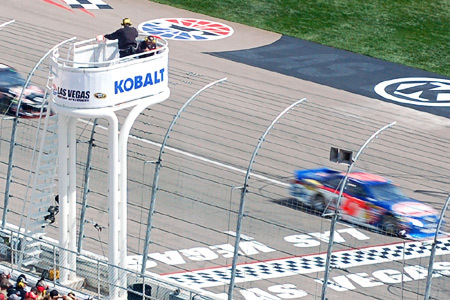 I mentioned in the introduction to the first installment that I'd never been to a NASCAR race. 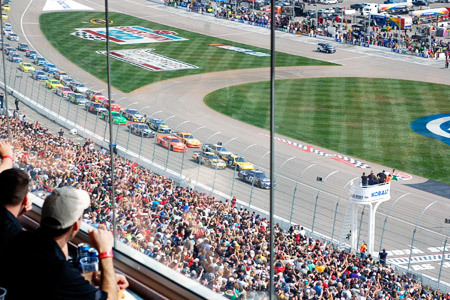 Sure, I've seen several races on TV, and I was even in the pits with a buddy for a small town (really small) stock car race in Iowa back in the early nineties, but I'd never been to a "real" race before. I've heard about how cool it is to see one in person, but I hadn't ever really had the opportunity to see one live. Man, was I in for a surprise! In part two I talked about the festive atmosphere in the sea of RV's. All day Saturday we heard the noise of the Nationwide Series race, followed by evening practice runs, but it was all from the parking lot several hundred yards away. 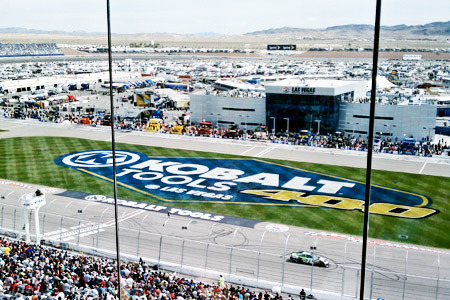 Being so far away, and never actually seeing the track, you can't really imagine the enormity of the whole thing. It was basically background noise with several helicopters and small aircraft with advertising streamers behind them endlessly circling the track. We boarded the bus at about 7:30 AM to head to the track. At first I was thinking, "Do we really need to leave that early?! ", but the answer soon became very obvious. I mentioned earlier that there were about 180,000 people in attendance at the race. Well, apparently most of them weren't already there, despite the view of the parking lot the day before. The traffic was a mess, and I think it took us more than an hour to get there. The good news was that Marcus Wang, Kingsford senior scientist, sat next to me and we had a great conversation. The guy knows his charcoal! We arrived at the track and immediately went to the Kingsford suite. It's on the fourth floor just past the start/finish line. It's a very nice place from which to watch all of the festivities. 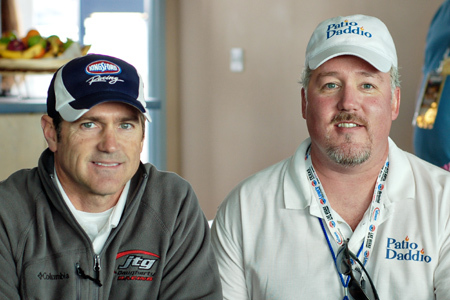 After hanging out in the suite for a little while we got to meet the driver of the number 47 Kingsford car, Bobby Labonte. 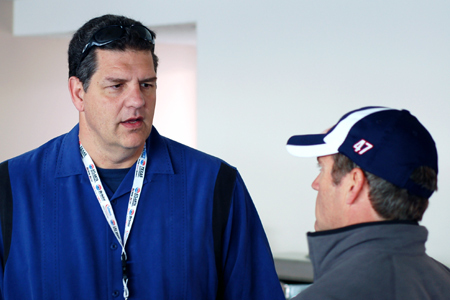 ESPN analyst Mike Golic also hung out with us for a while before the race. Seeing him next to Bobby really shows the stature contrast between NFL players and NASCAR drivers. Just for reference, Mike is 6' 5". Next we got to go to the Neon Garage to see the teams prepping for the race. 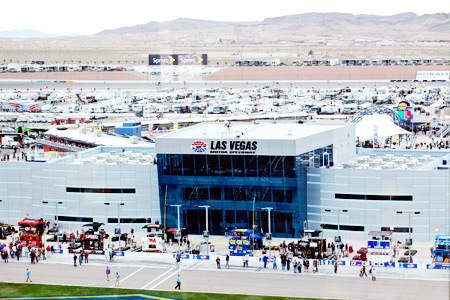 This is often referred to as "NASCAR Disneyland", and I can see why. You are right there in their garage area. You can see the everything from their tools to the car inspections up close and personal. We even had access to pit road, despite the fact that the security person that we asked said we didn't. Several others from our group made it out there, and my friend Meathead was kind enough to let me use his picture. The race started while I was in the peaceful relative quiet of the suite. While it immediately became significantly louder at the green flag, I still had no idea how loud it really is. Then I ventured out on the roof next to the spotters. It became immediately obvious why they gave us earplugs on the bus. Wow! More than forty cars running 9000+ RPM makes a lot of noise! They served us a nice lunch as we just relaxed, hung out, and enjoyed the rest of the race. I really enjoyed listening to the communication between Bobby, his crew chief and their spotter via headset throughout the race. Since there are no mirrors in the car, the drivers rely on spotters to verbally tell them what's going on around them. That blew my mind. Imagine the worst high-speed and high-traffic freeway driving that you've ever experienced. Now imagine that same driving with blinders on, your head duct-taped to the headrest, and your passenger yelling what's going on around you. It's pretty amazing, and those boys have this thing down to a science, as you'd expect. In the late laps of the race we hit the bus and headed back to the hotel to avoid the massive traffic. I must say that the NASCAR experience is something that will stick with me for a long time. Seeing it on television doesn't even come close to the sensory blast that you get in person. It was great! 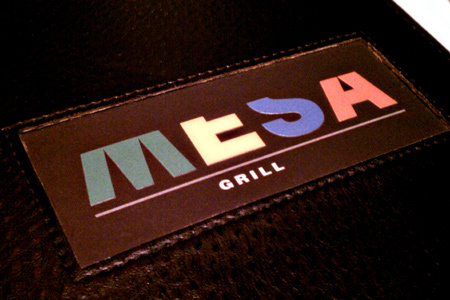 A bunch of us decided to round out our weekend by going to dinner at Bobby Flay's Mesa Grill inside Caesar's Palace. We're grill people, so it was a pretty natural choice. We caught the monorail at the MGM and off we went. The atmosphere was pretty cool, and very "Flay-esque". It was upscale but still comfortable. The servers were friendly, but the service was a little slow. I don't know how long we waited for our meals, but it felt like nearly an hour. For a party of six on a Sunday night it seemed slow. However, we had great conversation, so the time was well spent. 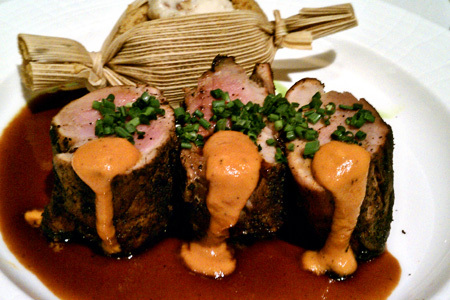 I had the New Mexican spice rubbed pork tenderloin with bourbon and ancho chile sauce, and a sweet potato tamale with crushed pecan butter. It looked great on the plate and the pork was perfectly cooked. The sauces were also very nice. The problem for me was the price. Yes, it's a celebrity restaurant, but what you see above was $36. That was way over the top for three pieces of pork and a small tamale. It was good, but not that good. After dinner we all wandered our separate ways back to the hotel and that ended our wonderful trip to Kingsford University. It was a serious blast, and I'm very glad to have had the opportunity to hang out with a bunch of great foodies. 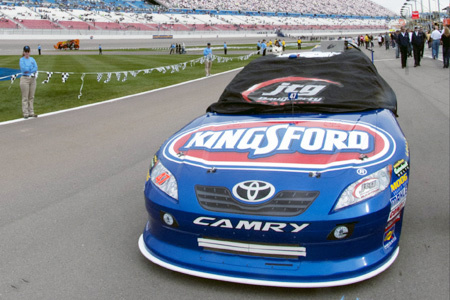 My sincere thanks to the folks at Kingsford, Current, and everyone else that made it such a great event! Great review of the whole event. The race is a real thrill that's for sure. I was working the sea of rooftop RVers inside the track selling ice. It was a fun event for me as well. Next time...I'm hunting you guys down for a great demo on my break. Man what a ride! I enjoyed reading the whole adventure!